We meet once a term on a Saturday morning at St Matt’s church, from 8.30am – starting with coffee and croissants – followed by worship, teaching and ministry ending at 10.30am, so you still have your day free. This is a time for all women to meet, enabling us to spend time with God and draw closer to Him, without any of the distractions of church. Speakers come from within St Matt’s, the neighbouring churches and further afield. We regularly hold Quiet days and Women’s days so that we can meet for extended times together. 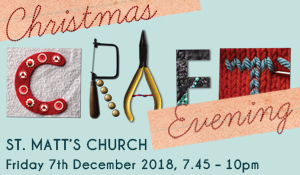 Our annual craft event is back this year, click on the image below for more details.